Home  My Gleanings Page  Illustrated Edition - Page 9. Illustrated Edition - Page 9. Francis Marion Clement was born on a farm in Crittenden county Sept. 21, 1828. His father, Isham Clement came from Prince Edward county, Va., in 1818, and settled on the Kentucky river. In the year 1819 he moved to what is now Crittenden, settling near where F. M. Clement now [lives] hewing out of the forest a home for himself and enduring the many hardships incident to pioneer life. Before leaving Virginia he had married Miss Sallie Clark Rudd. To them twelve children were born, the youngest of whom is the subject of this sketch. F. M. Clement had very little school advantages, attending the very primitive country school at what was known as Lizzard Point; he worked on the farm all his life, making a regular hard working hand, during all the younger years of his life. After reaching his majority, he began life for himself on a farm. Later he speculated in tobacco and at one time made considerable money; reverses came as they do to trades, and he lost all, but with the courage and will power that makes the indomitable man, he soon retrieved his lost fortune and has been a successful farmer and trader ever since. He now owns one of the best farms in the county, raises grain and stock extensively, and his splendid country home, seven miles from Marion, is one of the most hospitable in the county. Years ago the people among who Mr. Clement was reared, realized his sterling qualities, and great worth as a citizen and a patriot and in 1882 prevailed upon him to become a candidate for the State Senate. He won the nomination easily, and in the final election defeated J. W. Orr by over 1000 majority. Last year when a strong candidate was needed to over come the combined opposition, he was nominated over several gentlemen and easily defeated Mr. Isaac Linley of Livingston county. In public life Mr. Clement is a tireless worker, and uncompromising in his devotion to what he thinks is right; no constituency ever had a more faithful servant. He is a strong Democrat. As a private citizen he has all the good qualities that enter into the good man, and faithful friend. Is the present Democratic nominee for sheriff of Crittenden county. He was born in Livingston county, Ky., in 1847, and was raised on a farm. He attended the public schools, getting a fair common school education. In 1870 he went into a store as clerk and there attained experience in a business way. Later he married and settled on a farm, and since that time he has devoted himself exclusively to farming, and in that line he has been successful, gathering around those comforts and conveniences that come to the energetic, careful farmer. He owns a farm in the Tolu vicinity; there where he has lived and labored so long, he has the respect and esteem of all, and warm friendship of many. As a good citizen he has few superiors. This year he was prevailed upon to accept the Democratic nomination for sheriff, his party knowing his superb qualifications for the office and his high standing as a citizen. He stands as a representative of the best citizenship of the county, honest, industrious capable, and appreciative of the obligations to duty, Green B. Crawford as a citizen does honor to the county, and if elected will reflect credit upon those who vote for him. 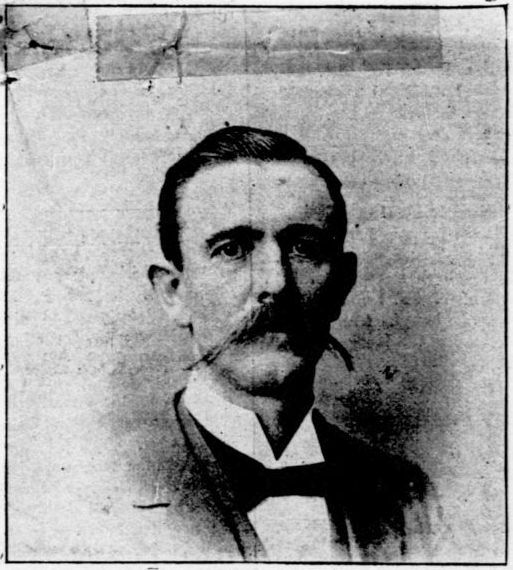 J. F. Flanary was born on a farm in Crittenden county Oct. 14, 1855. He was a son of Jas. F. Flanary, who died some twenty years ago, leaving a wife and nine children, the care of which fell chiefly to the subject of this sketch. With these responsibilities upon him, he has been a hard worker, toiling on the farm to support those thus left to his care. All who know him know that he was faithful to this trust. 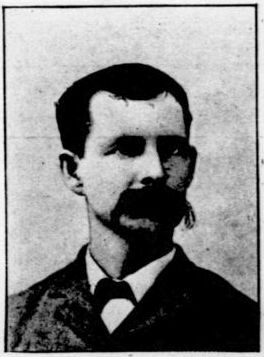 In 1882 he was the Republican nominee for coroner, and elected by a handsome majority. In 1886 he was re-elected. Four years ago he was a candidate for the Republican nomination for assessor, and was defeated, but he has assisted in listing the property of the county every year since then. This year he won the nomination and is now asking the people of the county to elect him. He is an honest man, an industrious, good citizen, and if elected will make a capable officer. The picture that accompanies this sketch is a fairly good one. Rev. W. H. Miley, pastor of the Marion Presbyterian church, was born in Rockbridge county, Va., November 28, 1859. He graduated from Washington and Lee University in 1885, and from the Union Theological Seminary in 1888. His first charges as pastor were the Corydon and Uniontown churches. In 1890 he was called to the pastorate of the Marion church. He is one of the most popular preachers we have; his popularity is not based on an ephemeral foundation. His ministry has none of the sensational features, but as an earnest preacher of the truth, an attractive speaker, and a close reasoner he is highly appreciated by his prosperous and growing congregation. His congregation is one of the largest and wealthiest in the county, and the organization of the church antedates all other institutions of Marion. The church was organized in 1804, and a building erected on the site of what is now known as Crooked Creek; the church was then called Bethany, and Rev. Mr. Dickey was the pastor; later the property at that place was sold to the Baptists and a brick building erected where Marion now stands. Here the congregation worshipped for years and grew in strength, under the pastorate off such men as Hawthorne, Rankin, Perkins, Allen, Matthews, and others. A few years ago the church divided, part of the congregation going to Chapel Hill, while most of the members formed a new congregation under the Southern branch of the church, and built the handsome house of worship that now adds to the substantial appearance of Marion. Since then the congregation has grown steadily until it is now almost as strong as it was before the division. This church has done great good in the county. Founded when civilization first set up her standard in this section of the Dark and bloody Ground, she has administered to the spiritual welfare of the living and buried the dead with the consolations of christianity. The records of this church have been preserved since 1807 at which time there were 39 members. These records show that the members were subject to discipline in those early days as well as now, and perhaps the lines were drawn a little more taut then than now. One sister was before the session for talking about a neighbor, a brother was disciplined for getting intoxicated, and about 1807 one member was lectured for going off after the disorganizing part of the Cumberland Church. The subject of this sketch was born on the banks of the Cumberland river near Pinckneyville, Livingston County, Ky., Oct. 3, 1870. His parents, Octavus and Ella E. Hodge, both trace an unadulterated Anglo-Saxon lineage. His father's people came from N. C., to what was then Livingston county, and settled near Levias. On his mother's side, he boasts of a direct descent from the first governor of Kentucky--Isaac Shelby. He was raised on the farm and attended the public schools untill [until] 18 years of age. When 14, he spent three months with his father in Florida. 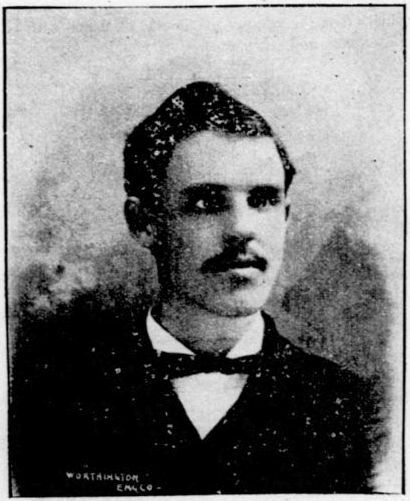 In 1888, he entered the college at South Carrollton, Ky., and lacked but six weeks of taking the degree of B. S. In August 1890 he went to Searcy, Ark., and took a four months business course, and then traveled over Missouri, Iowa and Kansas for a St. Louis Drug Co. Returning to his native state, he taught three terms in the public schools of old Livingston with marked success. During the interim, he clerked five months S. D. Hodge at Salem and Marion. 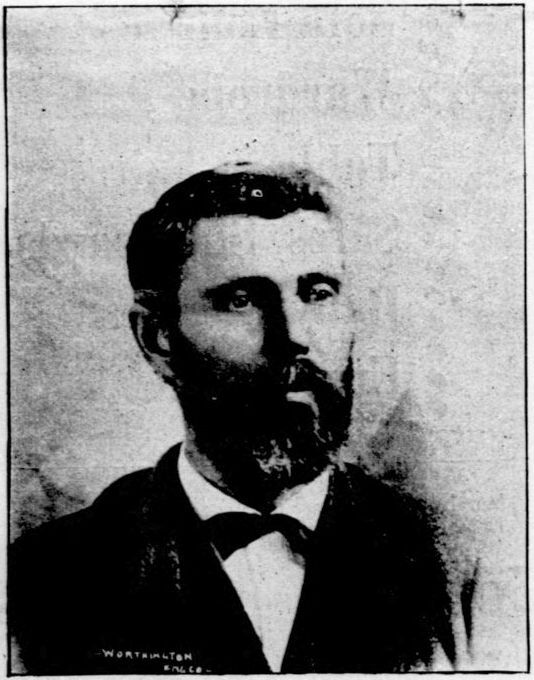 Amid all the changes, the desire to preach, which was implanted in conversion at South Carrollton never left him, and Jan. 1, 1893, he was licenced [licensed] by Pinckneyville church to preach. On a call by Dunn Spring, church, Crittenden county, he was ordained to full work of the ministry, Jan. 8, 1894. He now has the further care of Dyer's Hill and Sexton Spring churches. He will enter Bethel in the fall for a three years course and from there to the Baptist Theological Seminary at Louisville. He is unquestionably a young man of talent, and great promise. The picture that adorns this sketch is a splendid likeness of Crittenden county's candidate for Railroad Commissioner, about which the PRESS has already had something to say, and by way of parenthesis we pause to remark, that every man in Crittenden county is anxious that this representative of our citizenship be given the honor he so richly deserves, and the work he is so amply equipped to do. Dr. R. L. Moore was born on a farm in Crittenden county, Nov. 16, 1858. His father the late R. L. Moore, sr., was likewise a native of this county, and his father Alfred Moore came to what is now Crittenden about the year 1800, from North Carolina. R. L. Moore's (sr.,) mother was a sister to Rev. Wm. Love, one of the pioneer ministers of this section, whose father was killed by the Harpe's. The subject of this sketch was reared on the farm and when he had grown old enough to do farm work, he made a hand at whatever there was to do. One day while working in the harvest field at the age of 16, he was overcome by heat, severe illness followed, and the lameness with which he is now afflicted, was the result. Having been thus disabled from active farm work, he devoted himself assiduously to study, and in a short time he was teaching school. In 1879 he entered the Medical College at Louisville, and in 1882 he graduated. He practiced medicine for a few years, achieving success both as a physician and surgeon. About this time his father's health began to fail, and the young doctor was asked to take charge of the large business interests that had been built up by the father. The young man took hold of these affairs and in devoting himself to them, necessarily curtailed his practice. Finally he and his brother formed a partnership and conducted a large mercantile business at what is now known as Mattoon. Later he moved to Marion and took a position in Marion Bank as assistant cashier, and was later elected Vice-President and then President of that well known institution. A few months ago he sold out his interest in the bank, and at the earnest solicitations of his friends in this county he became a candidate for railroad commission. He has always been a simon pure Democrat and an active worker for the success of his party. He is at present chairman of the county committee, and as such is highly esteemed by his party. He is a member of the Presbyterian church. He is a good citizen in every particular. Full of county pride, he has joined hands with all enterprises for the county's good. Nothing would delight Crittenden county more--than to see him nominated and elected railroad commissioner, knowing that he would fill the place with credit to himself and bring honor to the good county that gave him birth. Is a resident of Dycusburg and is the Republican nominee for jailer. He was born in Crittenden county June 26, 1856, and like most of the other people of Crittenden he was raised on a farm and brought up in the ways of the farmer. He was a son of Reuben C. Hard, who died when his five boys were small. At an early age A. S. Hard began teaching in the public schools and proved to be a successful teacher. Later he clerked in J. H. Clifton's store, and was quick in learning the business. He embarked in business for himself at Dycusburg. He is a staunch Republican and served the people of Dycusburg as postmaster under the Harrison administration. He believes that to the victor belongs the spoils, and when Cleveland went into office Mr. Hard promptly tendered his resignation as postmaster. He was such a great admirer of Mr. Blaine that one of his own boys bears the distinguished statesman's name. Mr. Hard won the Republican nomination for jailer over some popular gentlemen. He is one of the most pleasant men one meets with in Crittenden county; he is full of energy, and would make a capital jailer if elected. Ex-Representative Jas. 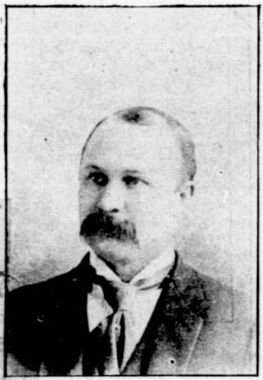 R. Summers was born in Livingston county June 3, 1859; he is a son of W. H. Summers, a native Kentuckian, and his mother was a daughter of Jas. Rutter, who was at one time the surveyor of Livingston county, when that county embraced the territory now included in Crittenden. Mr. Summers was reared on a farm, and educated in the public schools of his county. 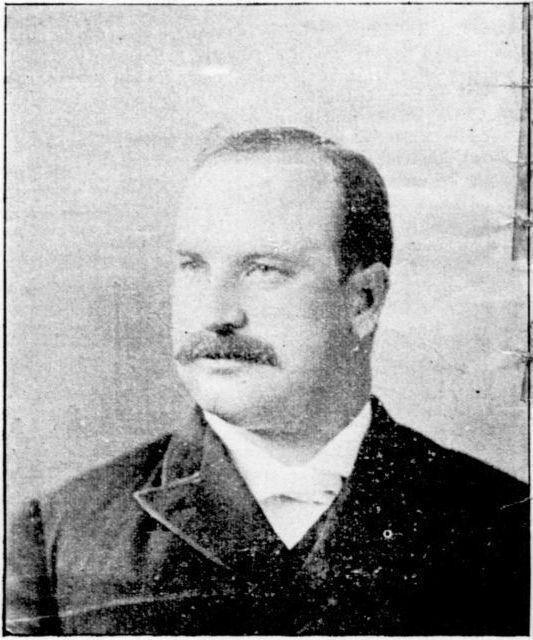 In 1890 he won the Democratic nomination for the legislature, and at the August election, he defeated Mr. J. T. Franks our present sheriff, by a handsome majority. Mr. Summers went to Frankfort with little knowledge of legislative matters, but his natural ability, quick perceptive powers, and earnest devotion to the work soon made him conversant with all the questions before the house, and he proved to be a splendid member. He served during the long session and at a time when the best talent was needed, and he made an honorable record, and his people approved of his course. Since then he has continued farming and also embarked into the mercantile business at Salem, under the firm name of Rappolee, Summers & Co. His career public and private is eminently honorable and adds to the good name of his county and people. Crittenden is one of the few counties in the state that has broken away from the old idea that the offices were created for the men and men only. 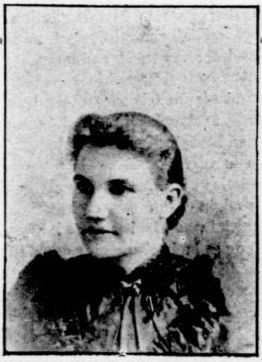 At the last November election Miss Mina Wheeler defeated George W. Perry for School Superintendent by one vote, after one of the most remarkable campaigns in the history of the county. Miss Wheeler is a native of the county. She educated herself and at the time of her election was one of the best teachers in the county. Her friends had previous to this solicited her to become a candidate, and she at last consented and created more real, genuine enthusiasm among the people than any other person who ever asked for office in the county. She made a number of public addresses of an educational nature and the people, learning that she was thoroughly competent and was deeply interested in the schools of her native county, rallied to her support. At first there were those who would not vote for a woman, but when they met Miss Wheeler or heard her addresses their prejud[i]ce vanished, and when the election came on and the vote was county, and she had a majority of two, her opponent contested the election, and after hearing the contest the board gave her a certificate of election, and declared that she was elected by one majority. She will enter upon the duties of the office next Monday, and Crittenden would not exchange her Superintendent for any in the state, or any other state. One of the best known men in the county is Thos. J. Yandell, Jr. He was born in this county in 1859, and was reared on the farm. He is the son of Mr. Jno. 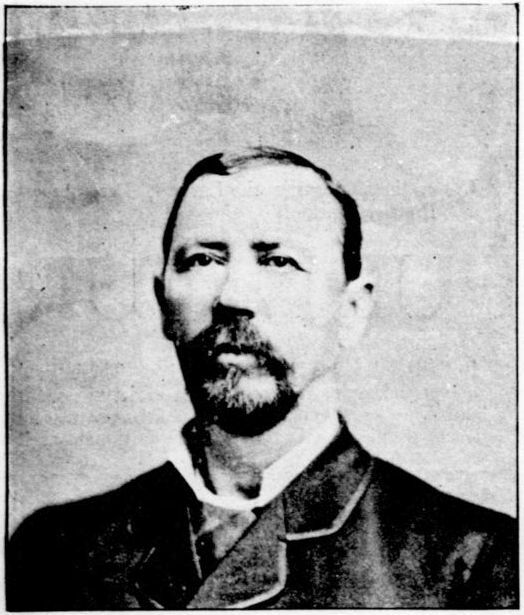 A. Yandell, one of the pioneer citizens of the county. At the age of twenty Thos. Yandell left the farm and began teaching in the public schools. In 1886 he was elected assessor on the Republican ticket defeating a popular man by a handsome majority. In 1890 he made the race for county clerk, but was defeated by a very small majority. In 1890 he sold his farm and embarked int [in] mercantile pursuits. On May 10th, 1892, he accepted the position of assistant cashier in Marion Bank, which position he still holds. 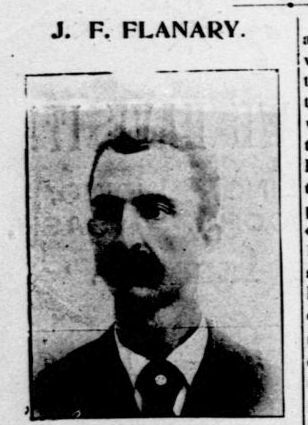 On Jan. 19, 1887, he was married to Miss Katie Franklin. 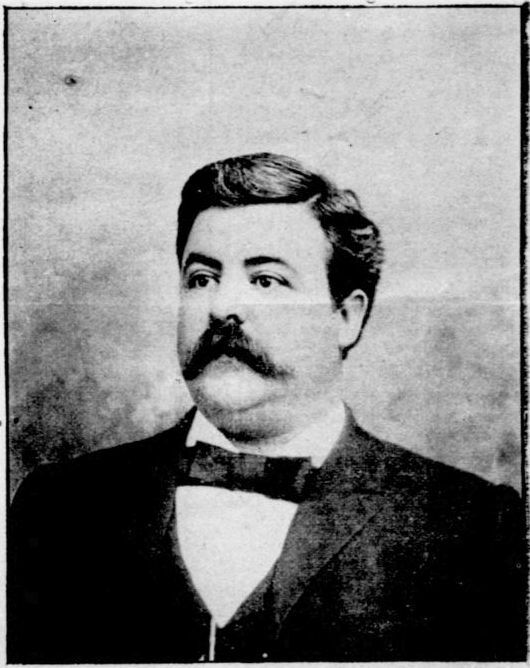 Mr. Yandell's acquaintance extends over the county, and the people not only appreciate his business qualities, but hold him in high esteem as a citizen. As a teacher, as a county officer and as a bank officer he has endeared himself to the public and he is readily classed as one of the leading young men of this section. The people of Marion are pleased that he has purchased a home here and invested in the bank as a stock holder. Such men increase the substantial, material standing of a community, and it is a good day for the town when they decide to cast their lot with it. H. H. Loving was born in Hopkins county April 14, 1859. He attended the public schools of his county, and Princeton College, and the select school of Prof. Hanson Bouring at Madisonville, getting a splendid education and thoroughly equipping himself for the active business life and the responsible positions he has filled since his majority. In 1878 he entered the L. and N. office at Madisonville as assistant agent, and was in the offices of that company continuously until 1887, serving as agent at Berry's Station, Mortons Gap, and Madisonville. In 1886 he severed his connection with this road and came to Marion with the advent of the O. V. and took charge of the office here. 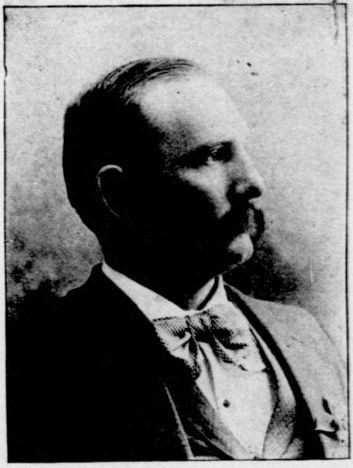 At the end of three months he resigned, retired from the railroad business and was elected Cashier of Marion Bank at its organization in 1887; and has since been thus closely connected and identified with this prosperous institution. Since his coming among us Mr. Loving has grown in popularity and into the good graces of the people of Marion, and the county. His position as a cashier of the bank has brought him into close relationship with the business men of Marion, and by them he is held in high esteem. He is a public spirited citizen, and realizing this the citizens have twice asked him to serve on the Board of Trustees, and in that capacity he has used his best endeavors to advance the interests of Marion, urging street improvements and insisting upon such other modern improvements as our finances justified; advocating the Graded School and interesting himself in all the things that promised material advantage to the town and county. Two years ago Mr. Loving was tendered the position of Cashier in the Collector's office, his splendid abilities attracting the attention of our congressman and collector. He preferred, however, to remain with the bank, and the success of that institution owes a great deal to his prompt business methods, untiring energy, affable manner and courteous nature. East Marion is the name given to that portion of the town east of the depot. The town is growing in that direction and some pretty cottage homes have been build in that vicinity within the last twelve months. East Marion is not in the corporate limits and enjoys all the advantages of the town without having to pay town tax. 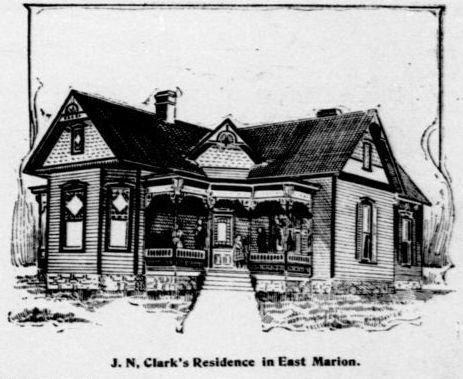 Among those who have invested in this locality and built and bought pretty homes are J. N. Clark, a picture of whose handsome residence appears above, C. E. Weldon, Will Hill, J. O. Olive, J. W. Goodloe, A. C. Moore, J. C. Elder, jr., J. B. Kevil, A. T. Gore, Same Hurst, J. R. Clark and J. H. Clark, own beautiful unimproved lots. A. L. Cruce will arrange to put up a nice home residence. It is one of the best neighborhoods in town, high, well drained, it commands the view of the surrounding county. Pretty lots are for sale in east Marion very low. Source: Crittenden Press. (Marion, Ky.) 1879-1907, August 16, 1894, Image 9 - Chronicling America - The Library of Congress.